CHESAPEAKE BAY SKIPJACK MINNIE V! MODEL DIMENSIONS: 29 1/2" L x 28" H x 6 1/4" W WEIGHT 1 1/2 lbs. Presented is an exceptional Chesapeake Bay Skipjack model which is offered in completed form at an unusually reasonable price. She is built using plank on bulkhead wood construction in the same manner as the original, plank by plank, and then finished in seven coats of high gloss enamel and varnish. If you do an internet search. 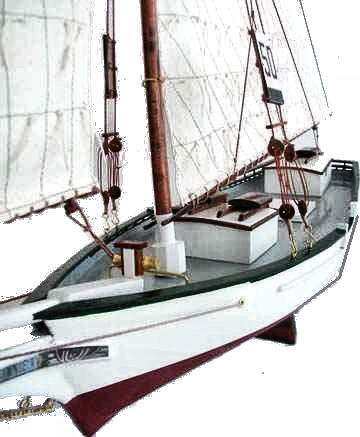 finished models of the Skipjack design cost from $1200.00 and up. 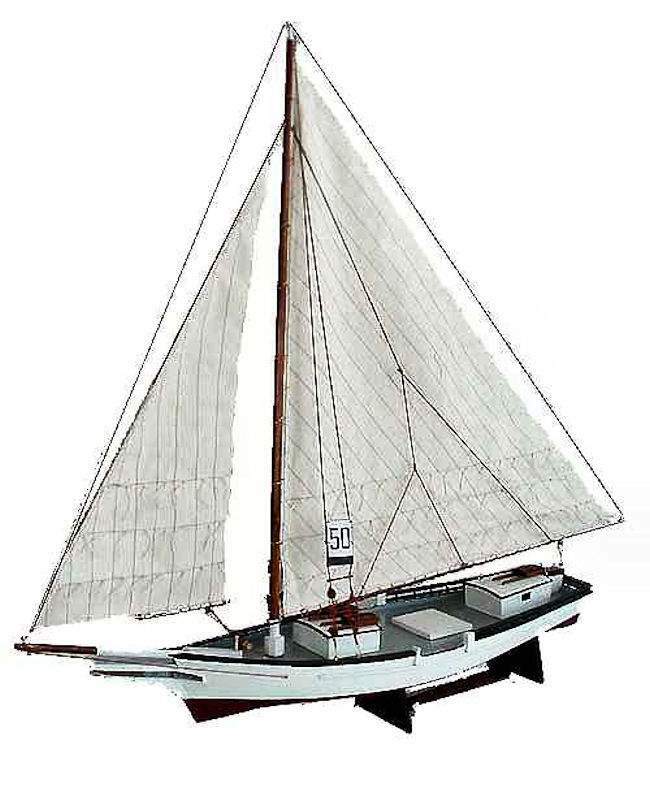 Our replica of the original Minnie V features a Marconi main and clubfooted jib with carefully stitched sails with reef points. Everything is done properly to make this an incomparable model. It has a beautifully enameled white hull with forest green cap rial, two white deck houses, and painted decks. Measurements are 29 1/2 LOA", 28" high (base to the top of mast) by 6 1/4 wide. 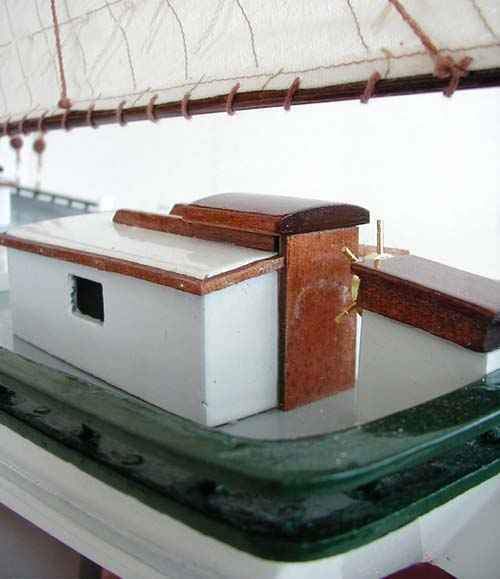 Its stitched sails, and enameled hull paint, and detailing are exceptional. MINOR ASSEMBLY REQUIRED: To save cost, this model is shipped with its masts down and bowsprit housed. For most people, it is a simple affair to step the masts, rig all the stays and shrouds, and attach the sails. The detailed instructions are excellent, and the sails have numbered stickers on them, but if you have a problem, email or call us for guidance. International buyers welcome, but should inquire first. We have satisfied customers in Argentina, Australia, Austria, Belgium, Bermuda, British Virgin Islands, Canada, Chile, China, Czech Republic, Democratic Republic of Congo, Denmark, Estonia, England, France, Germany, Greece, Holland, Hong Kong, Hungary, Iceland, Ireland, Israel, Italy, Japan, Kuwait, Latvia, Malaysia, Martinique, Mexico, New Zealand, Norway, Nova Scotia, Panama, Poland, Portugal, Puerto Rico, Romania, Russia, Saudi Arabia, Scotland, Singapore, Spain, Sweden, Switzerland, Thailand, Turkey, United Arab Emirates, USVI and the Eastern Caribbean. In the late 1800's and early 1900's, skipjacks were familiar sights in every port on the Chesapeake Bay. The captains and crews were hardy souls who earned a living in the harsh conditions of wintertime dredging for oysters under sail. Like many other native Chesapeake Bay craft, the Skipjack was constructed with a specific purpose in mind. The vessels were built with a broad beam, a flat or V-shaped bottom, and small draft for dredging in the shallows. These boats could be run by a small crew due to the unique sail plan. Typically, a Skipjack has one self-tending jib and a large, triangular mainsail. This combination made sail handling easier than it would be on a gaff rigged boat and provided the power needed to drive the vessel along the oyster beds. There is much debate about how the term "Skipjack" originated. Some believe that it may have been derived from the New England fisherman's name for the flying fish, Bonita. In some parts of the Chesapeake, these vessels are also known as "bateaux". Due to the great number of vessels engaged in the oyster trade during the late 1800's, the state of Maryland passed a law in 1865 which forbade oyster dredging by powered vessels. For almost 100 years, Maryland skipjacks used only sail power for fishing. However, most skipjacks had a small "push boat" to get them out to the fishing grounds faster. The push boat's bow would be positioned against the skipjack's stern and its powerful engine would move the Skipjack quickly through the water. Once out at the fishing grounds, the push boat would be lifted up out of the water on the skipjack's stern davits until it was time to power back into port. In 1966 Maryland revised the law to allow skipjacks to dredge under power two days per week. In 1884, the Maryland oyster harvest reached an all-time peak at 15 million bushels. At that time, there were more than 1000 skipjacks fishing in the Bay. Today, the remaining skipjacks number less than 30. History ­ The Minnie V. was built in 1906 in Wenonah, on Deal Island which is located on Maryland's Eastern Shore. Built by John B. Vetra, the boat was named after his wife, Minnie. The "V" stands for her last name, Vetra. The Minnie V. has had many different owners and has spent 87 years in the oyster dredging business. In 1981 the boat was rebuilt by Lebourne Smith. Today Minnie V. now a National Historic Ship, sails as a part of the Living Classrooms Foundation's educational fleet serving thousands of students per year.